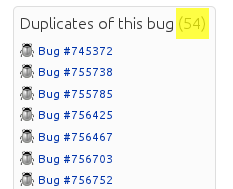 I was looking at a bug with a large number of duplicates the other day and found my self wondering exactly how many duplicates it had. 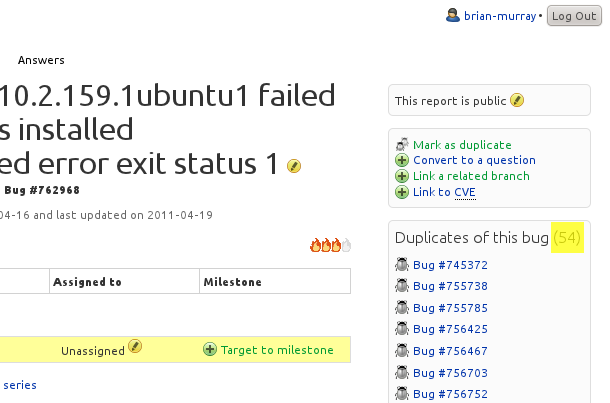 This information actually appears in the page source for the bug report however its a bit hard to read there! So I wrote a new Launchpad Greasemonkey Script to display the quantity of duplicates in the duplicates portlet. I’ve hightlighted the duplicate count in the screenshot to really point out where it is. I’ve also updated the firefox-lp-improvements PPA which contains a Firefox extension collecting all of the Launchpad Greasemonkey scripts with the new script.